Celine Mudahakana escaped the 1994 genocide with her mother and brother. Years later, in 2007, the family wound up in Putney Vermont where her mother set a wonderful example for social consciousness, pursuing a degree in peacebuilding and conflict resolution at the School for International Training in Brattleboro. Celine, speaking only Kinyarwanda and French, her native languages, started school in Putney, Vermont and was drawn to the visual arts as a means of expression as communicating with her fellow students at that age was not easy. Celine went on to pursue her studies at Mt. Holyoke College in Western Massachusetts. She became involvement with the CHABHA Organization (Children Affected by HIV/AIDS) back in Rwanda who she wove and sold scarves for. Donating the money from these sales to those in need, became the impetus for going back to her native country to help women by teaching them weaving, one of the many skills she had mastered. Celine attending the Clinton Global Initiative University in 2014 and was awarded a $10,000 grant by the Davis Projects for Peace to pursue Weaving for Peace, an initiative to create a women’s weaving cooperative. From the first scarf she sold, Celine knew this had the power to be life changing for women who needed to support their families. Many lacked enough money for food and or to send their children to secondary school which is not free in Rwanda. The $98 they earned from the sale of each scarf made a huge difference in their lives. Sometimes that money was the equivalent of a month’s income. 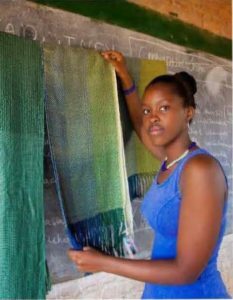 Celine realized that teaching women from Rwanda to weave could be the transformative change in these women’s lives that they needed to pull themselves out of poverty. Supported by her weaving teacher from the Putney School, Melissa Johnson, and some of her other students, Celine returned to Rwanda to build foot-powered looms. She then taught 12 Rwandan women, ages 20-25, to use the looms and weave cotton scarves. The group, recognized by the Rwandan government as a collective is called Isano Weavers. Isano means unity in Kinyarwanda paying tribute to Celine’s desire for reconciliation and unity in her home country. Celine’s drive to make the cooperative self-sustaining and profitable led her to IDEA4Africa where she and the cooperative members could all learn the business skills they were lacking. They are now working with CHABHA volunteers, Putney School volunteers, the GA Collaborative (a nonprofit Boston-based architecture company) and a Mount Holyoke social media student to help with the next phase of expansion into a new center in Nyamata. The new building facility will have water and electricity unlike the rented space they have been in. This next step is exactly what they had learned from the IDEA4Africa workshop they attended that was developed specifically for them: The importance of growing and utilizing your network for help and expanding at a pace that allows for the time needed to learn what works and what doesn’t and to then take the next steps accordingly. “Some kind of creativity and art has always been there for me, helping me.” Celine realized she could use that creativity to help others.